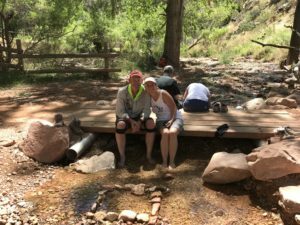 We just finished September 2017’s R2R and R2R2R. I knew I had neglected the blog for a long time, but I just realized how long. 2016’s June R2R2R was exceptionally hot, as are the forecasted temps for this month. Despite an early June hike date, the inner canyon was 115 and 117 on hike days. Dangerously hot. We pushed the start time back to 1 AM to give us a chance to get through The Box both directions. It was the best decision under the circumstances, but never again will we R2R either direction over 110 degrees. You just can’t prepare for it and the rocks magnify the heat. We saw multiple hikers with broken blood vessels in their legs and swelling from the heat, unable to pump blood out of their extremities. Seasoned rim to rim hikers and runners who had never had this occur. It was 115 on our South to North day. We got an early start and made it down and through Phantom with no problem. We made it through The Box, started resting often in what little shade there was which is almost none. We took the detour to Ribbon Falls to get into the cold water. In all these years I had never detoured to Ribbon and it was an amazing break from the heat. Around Cottonwood the heat really became a factor. By the time we left Manzanita (the last water stop as you start to climb out North Kaibab) we were moving slow. One of our group became ill and I dropped back with her, she began vomiting every 20 minutes or so the entire way out. A down-to-her-knees level of vomiting. She is an experienced outdoors woman and Grand Canyon hiker, and she had never ever been sick like this. We switched her from electrolyte flavored drinks (even the thought of the fruity flavor made her ill now) to plain water and salt (my preferred method). We were alone by this point and even anti-nausea medication was not making any difference. She never gave up though, never gave in, but I was not so sure I was going to get her out of there that day. There is no way to get help and we encountered almost no other hikers that afternoon. The people we did see were only marginally better off than her. 17 hours later we finished our crossing and she was OK the next day but we all realized that was a life threatening situation. You just can’t get upside down with high heat and hydration, heat illness and exhaustion will strike even the fit and experienced endurance athlete. Never again will we hike over 110 degrees. 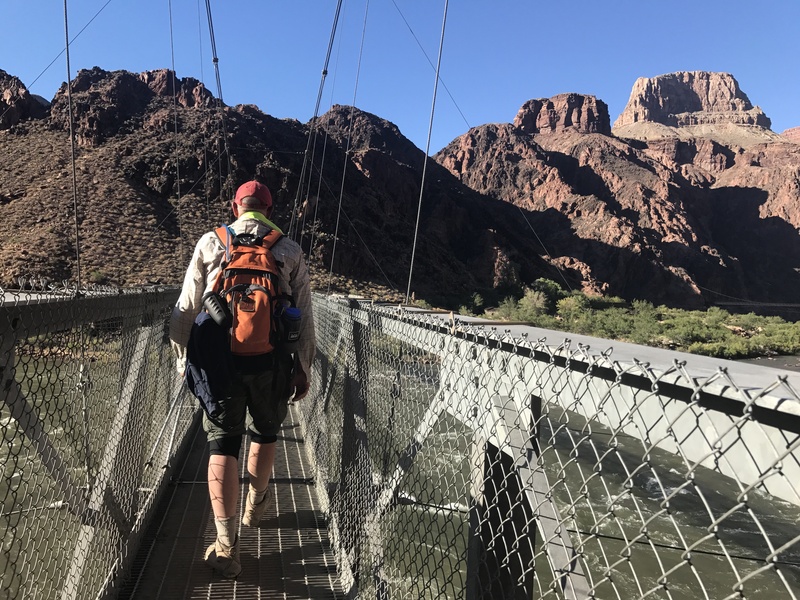 I did not hike back North to South in that 2016 heat, but some in our group did. That day it went to 117 degrees. 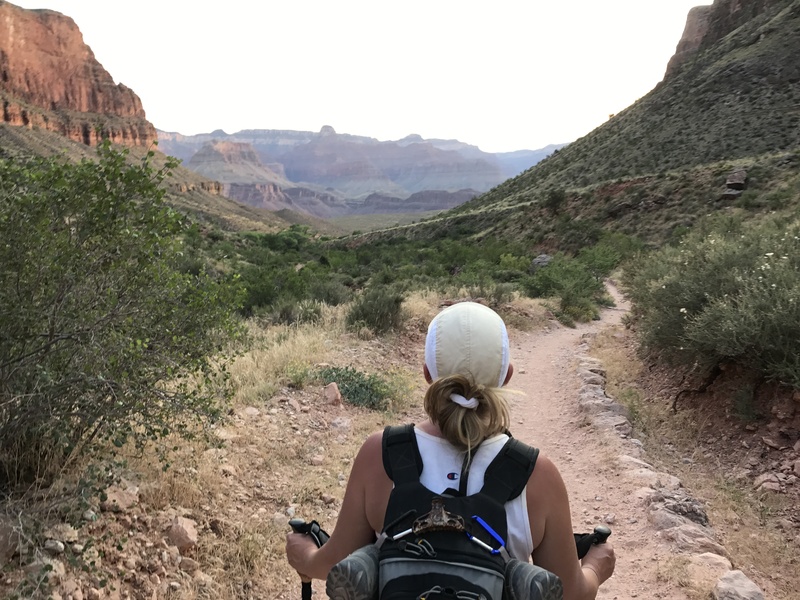 We pushed their start time back to midnight and told them to ride out the hot hours and wait until after 3 or 4 to climb out the Bright Angel Trail. We always climb out Bright Angel Trail and we never hike up and out South Kaibab, no water and no shade. They ended up sitting in the creek at Indian Gardens for 3 + hours then headed up in the late afternoon but even then it was difficult, extremely hard, and dangerously hot. We were lucky. In all of these years, I have never been able to get a room at Phantom Ranch. June 2017 was my lucky break and my husband and I went down there for 2 nights for a special occasion. The smart people cancelled in light of the approaching heat, lol. The forecast was not looking good and it teetered just below my 110 degree limit. We got a late start on the way down and we did not start down from South Rim to Phantom until 11 AM and that day. It was 109 official degrees. I don’t know the temps on the trail. At Indian Gardens the clocks said 100 in the shade and 110 on the trail, but then we started the brutal descent next to the black rock on the Devil’s Corkscrew and wave after wave of heat began. We came upon a man near the bottom of the Corkscrew. We heard about him from a few hikers we passed along the way “Guy alone in the Corkscrew, in trouble, out of water, share water if you can, someone is going to look for a ranger at Indian Gardens”. Solo hiking is the absolute worst, dumbest thing to do down there. You can get heat sick in an instant, wander off trail, be confused, make bad decisions, die. Sure enough we found the solo and gave him water. He was middle age, visibly physically worn out, and all he had were 2 tiny plastic bottles for water. Both empty. He had spent the night before at Phantom but he refused to turn around with us and head back to Phantom. Some decisions we live with, some decisions we live in spite of. Speaking of Park Rangers … we didn’t see any this trip. Not one. We heard there are normally 4 at Phantom but recent budget cuts to the National Parks cut that number down to 1 and the only 1 down there then was out on search and rescue looking for a missing 72 year old man. We normally see them intervening at the top of Bright Angel helping tourists not hike down farther than they should, but there were none this time. Cuts to park budgets are horrible, so anyone thinking they might get rescued if they get in trouble should really think again. There is certainly no 911 down there. Phantom itself was a delight. It is gorgeous down there. The stars, the sights. The cabin was darling, the food (only available to those staying at the cabins) was amazing, they even had beer and wine so I finally had my first beer in the Canyon!! But mother nature gave us 114 degrees that weekend so when we could no longer sit on boaters beach with our legs in the Colorado River we resorted to laying on the tile floor in the cabin to try and cool off. It was just too hot in the afternoon to do anything else. I had printed off an hour by hour forecast for both Phantom Ranch and Indian Gardens before we left, off NOAA. Go to forecast.weather.gov, search Phantom Ranch Grand Canyon Arizona (and then Indian Gardens Grand Canyon Arizona), and down under additional forecasts and information click on Hourly Weather Forecast. Print it out and take it with you. We studied it and realized our best bet was to set the alarm for midnight and to begin our River to South Rim via Bright Angel no later than 12:30 AM. And so we did. The night sky was amazing, the Milky Way was a cloudy ribbon in the sky. It turns out midnight is the witching hour for white little moths and scorpions so we saw a number of new friends along the way. We made it to Indian Gardens wells before daybreak and we hiked out as the sun started to scorch us again. The decision to hike at midnight was fantastic and a highlight to be repeated in years to come. Previous post: North Rim opens May 15, we hike in 3 weeks ! !